"I Was There When It Happened": R.D. Jones, PEERMUSIC LTD.
Back in the New River Valley! Come out, bring your friends and family, and get yourself some sugar-sweet harmonies and raucous bass and fiddle! Join the Darlings in the Church Hill neighborhood of Richmond, Virginia for a late night house concert you won't want to miss. Glorious harmonies, snarky song-writing, and boot-stompin' drive. Join us at the home of Grant Hunnicutt for a house concert, and stick around for square dancing, with calling by our very own Old Man Kelly. Bring your own libations, and snacks if you feel like them. Need the address? Get in touch with Grant at granthunnicutt@gmail.com or email the Darlings at donttelldarlings@gmail.com for all the info. Support local music! Move your booty to killer dance tunes! We'll see you on the flip side, RVa. The Darlings play 8-11pm and you enjoy the delights of Crossroads coffee, beer, and ice cream offerings. Did I mention cream puffs? Get there early to get a seat inside on a comfy couch. Snuggle in with hot chocolate, and enjoy. We're looking for a brunch show on Sunday as well. If you've got ideas, let us know! Josh Bearman of the Hot Seats and Allison Self are curating a monthly Americana series at Balliceaux in Richmond called Twangtown Thursdays. And the Darling's are opening the first one! Join us for an evening of merriment and old time, followed by Josh & Allison's stellar old-timey duo. For those of you pestering us about playing a gig in RVa, here's your chance! 10pm, and FREE! Red Eyed Rooster writer Laura Hauptman writes a glowing review of our new CD, "Sugar for Sugar". Quite frankly, it gets our eyes all misty just reading it. Thanks to all our fans and supporters; when we hear you say things like this about us, it makes us extremely proud and grateful to make music for you. Read this gorgeously-written review of the album here. Oh, and subscribe to Red Eyed Rooster's email list for everything in Americana news. Join us for 2 shows in the DC area, post-Thanksgiving but pre-holiday craziness. Thursday, December 1st, 8:30pm: The Darlings headline at The Black Squirrel, a restaurant/music venue/ craft brew lover's dream. Thursday is Burger Night, of which we plan to partake. Come early for burgers and eat in the upstairs restaurant, and head downstairs for tunes and brews at 8:30pm. With over 35 craft beer taps downstairs, you'll be certain to find the perfect libation for every heart-wrenching, ruckus-making song. $5 cover, and its our debut at the Black Squirrel, so help us make it a great one! Friday, December 2nd, 7:00pm - Our friend Alex opens his home again for a killer night of intimate Darlings music, house concert style. If you're interested in attending the house concert, please contact us for all the details. Don't miss us this Saturday from 2-4pm at Vintage Virginia Apples' Harvest Festival. Heritage apple varieties, cider donuts, apple pie tasting, vendors, more apples, forest-fed pork, and the Darlings. Lovely! 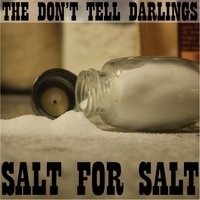 The Darlings are actively booking for 2011-2012 for venues in Virginia, North Carolina, West Virginia, DC and beyond. Contact us if you'd like to play at your place! Email booking@donttelldarlings.com for information on rates. Gettin' hitched? The Darlings also play weddings, family reunions, bachelorette parties, graduation and other special occasions. Email us for information. We'd love to celebrate with you! The Don't Tell Darlings had a heck of a time at our CD release; thanks to all who came out and were merry. The Blue Moon Diner was packed like we'd just asked Cville to play sardines. Thanks for y'alls support! This weekend we appear at the Crozet Arts and Crafts Festival. Don't know about this one? 2 days of local artisans, served up street fair style, with music and fun. This is kid friendly territory all. Hope to find you there. We're on Sunday, October 9th, 12:15pm - 2:15pm. Oh, and if you're sneaky, you might be able to find us the night before on the Downtown Mall for a more informal busking session. See you round, unless you're a square?